Here's a tasty version of hands across the border: Canadian border agents bring pizza to their American counterparts at the Ambassador Bridge and Detroit-Windsor tunnel. It was a way "to make Friday better for Detroit border guards who aren’t getting paid during the partial U.S. government shutdown," writes Sharon Hill of The Windsor Star. Canadian Customs and Immigration Union workers from Windsor delivered a dozen king-sized pizzas for three shifts of Detroit workers Friday, along with cannoli and coffee. "I think it will help lift their spirits," said CIU Local 18 president Ken Turner. "It's the least we could do." The Windsor border protectors and others kicked in over $600 for the gesture of solidarity across the Detroit River. 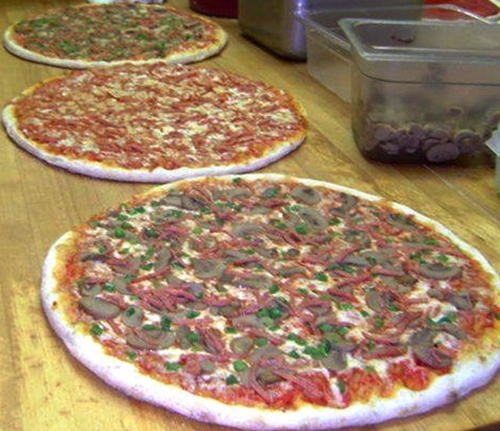 The king-size pies for U.S. Customs and Border Protection personnel came from Antonio's Pizza in South Windsor. There have been stories of hundreds of pizzas bought for unpaid American public sector workers, such as Edmonton air traffic controllers paying for pizza for Alaskan flight controllers and customs workers in Sault Ste. Marie, Ont., paying for pizza lunches in Sault Ste. Marie, Mich. . . .
"We know that our U.S. counterparts are without pay right now, and we were kind of inspired by the air traffic controllers on the East Coast who did the same for their counterparts in New York State," Turner said. "It's kind of been catching on." These law enforcers across the river clearly aren't crusty, unlike the treats they deliver.